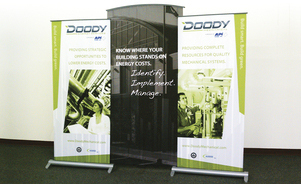 DURABLE, RENTABLE AND COST EFFECTIVE BANNER STANDS ARE PERFECT FOR EXHIBITORS ON THE GO! Quick and easy exhibiting! 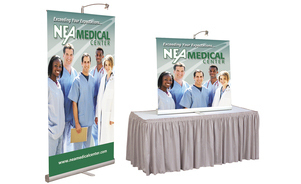 Banner Stand 3000R is a basic banner stand that can be used as a single unit or with three in line to fill a 10' booth space. A unique look! 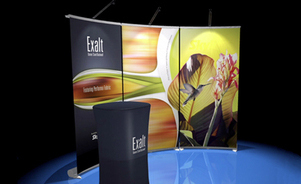 Exalt is the first retractable banner stand capable of converting from linear to a stylish curved configuration with the simple flip of levers. Myriad is designed with built-in merchandising capabilities! A variety of shelves and literature holders professionally display small products and brochures. 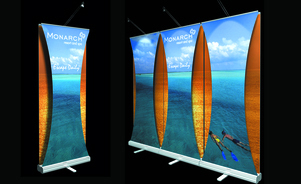 A complete banner stand backwall display – either Myriad or Exalt – within a single case that converts into a functional computer workstation with built-in wire management. The Shapes Collection uses the same sturdy retractable base as the 3000R, but has layered graphics. Front panel is available in a variety shapes to give your display and brand a contemporary edge. 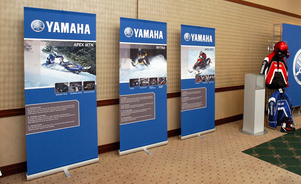 Get big graphic impact with systems that are lightweight and easy to use. Skyline banner stand graphic panels simply retract from their base and are easy to change when it's time to update. 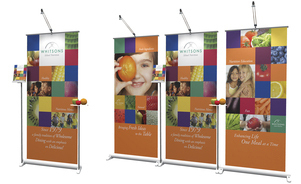 Because of their ease and mobility, banner stands are pefect for many applications like trade shows, special events, recruiting fairs, lobbies and more. Widths range from 34" (86 cm) to 48" (122 cm). 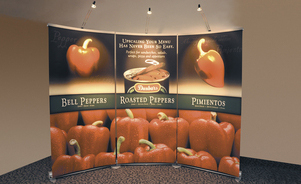 When you’re exhibiting, your display is your image and it affects how you are perceived. 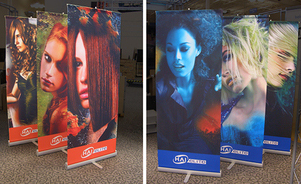 Skyline produces the highest quality displays and graphics in the industry so you'll always look great. 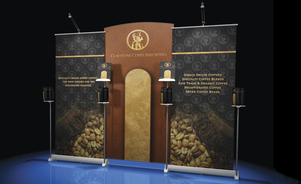 Ensure brand consistency throughout your network of dealers and associates by making available multiple, company-approved banner stand units. Skyline can even store and manage them for you. 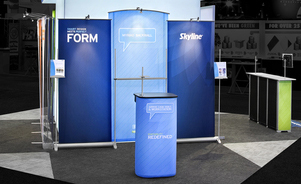 Skyline designers can transform your brand into a display that attracts attention giving your staffers opportunity to engage show attendees. Need more than an attractive graphic? Add shelving or literature holders with Myriad® or a multi-functional case table/workstation with Arrive®.